US Manager Cho Kim, with Sistema Biobolsa and the Miller Center for Social Entrepreneurship on how innovative technology could soon be helping Kenyan farmers. Small farmers supply over 80% of the food in the developing world, but today they are confronted with critical challenges of animal waste management, procurement of high quality and affordable fertiliser, and access to inexpensive and reliable energy sources. Climate change, increasing price pressures, and lack of affordable agricultural inputs threaten the viability of small farms, while unsustainable agricultural practices and energy dependency threaten ecosystems, and create further economic and environmental risks to food systems. What if we could harness Poo Power to improve the well-being of small-scale farmers while reducing our environmental footprint? Transforming waste into opportunity is at the core of Sistema Biobolsa. Founder Alex Eaton’s interest in solar energy and small-scale organic producers led him to a small town in Michoacán, Mexico in 2006. Here, Alex met Calletana Nambo, who had recently installed a homemade “biodigester” to convert her animal manure into energy and fertilizer at her small farm. Biodigesters use naturally occurring bacteria to breakdown organic waste into two useful by-products: a high potency natural fertilizer; and biogas, a natural gas that farmers can use for cooking, heating, and producing electricity. Seeing the impact in Calletana’s flourishing crops and bright blue cooking flame, Alex’s vision for Sistema Biobolsa was born. 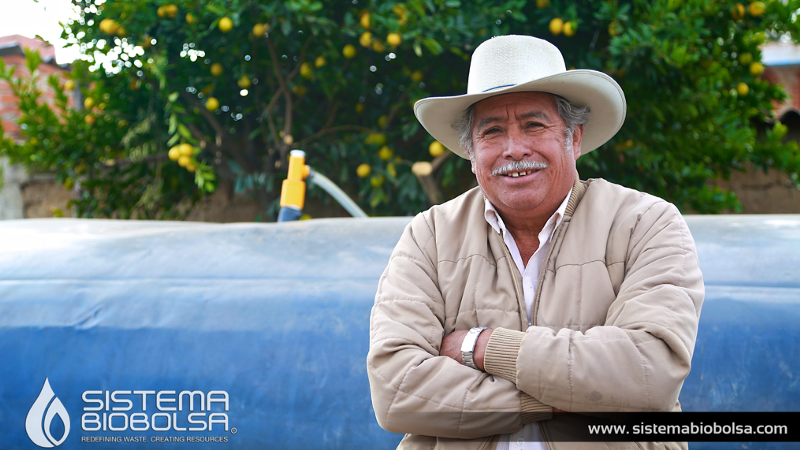 Sistema Biobolsa has since become the largest supplier of biodigesters in Mexico and Central America. By 2015, the organization improved the lives of over 20,000 people in rural Mexico. 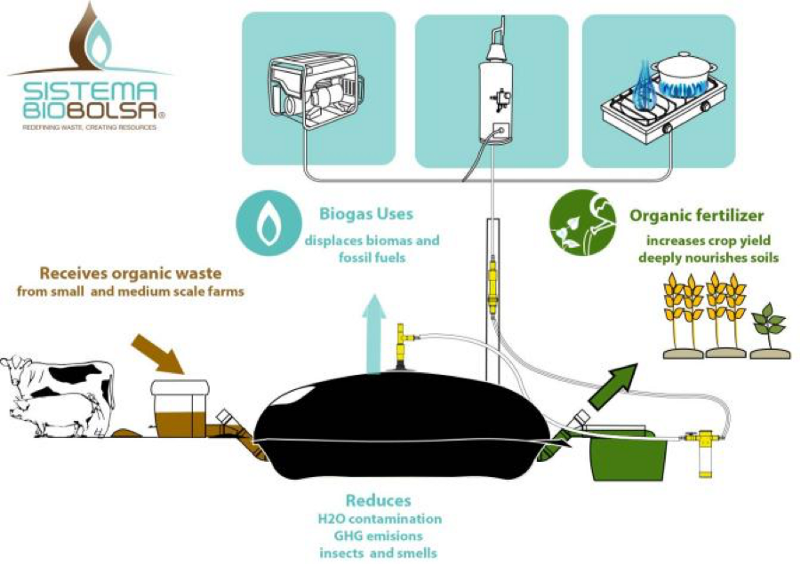 In addition to the product itself, Sistema Biobolsa sets itself apart from its competitors by providing high-quality services to help farmers finance, install, and maintain the biodigesters. Sistema Biobolsa’s technology has few competitive alternatives and it has been proven to work in diverse geographies around the world; thus, the company has decided to scale its offering across the globe. With 500 million small farms around the world, how can Sistema Biobolsa’s impact be replicated? The Sistema Biobolsa team brought this question to ICSF in early 2016. ICSF and Sistema Biobolsa co-designed a strategy and lean replication model for scaling Sistema Biobolsa to Nicaragua. After the successful opening of its Nicaragua branch, Sistema Biobolsa is now bringing this transformative technology to the African continent, starting with Kenya. An estimated 1.2 million farms with little biodigester penetration. The political will through initiatives such as Vision 2030 supporting its transition to renewable energy sources. A business-friendly way of doing business in comparison to other African countries. The case for replication: Why reinvent the wheel? Sistema Biobolsa is partnering with ICSF and Miller Center for Social Entrepreneurship, based at Santa Clara University, to provide strategic support for its move to East Africa. Miller Center supported Sistema Biobolsa in 2014 through its flagship GSBI® Accelerator program. Now, Miller Center’s replication initiative will continue to support its expansion into Kenya through strategic connections, funding, and mentorship. At ICSF, we believe that the social sector can achieve significant transformational change by broadening the reach of what has been proven to work rather than trying to reinvent the wheel. That’s why we are thrilled to be working with Sistema Biobolsa to scale its impact. Stay tuned for updates following our visit to Kenya in February 2017.